Mark Parnell’s Bill requiring the state government and local councils to notify people affected by Development Planning Amendments, such as re-zonings was passed by the Legislative Counil on July 3. Congratulations to all who supported the Bill’s progress. Alliance President Tom Matthews and Lizzie Crisp of the Prospect Residents Association were in the public gallery to hear the speeches and see the vote. Next, the Bill will go down to the House of Assembly where it will need to pass before it becomes law. It will sit alongside the earlier Bill that passed the Legislative Council earlier this year (Interim Development Control). The Alliance urges its members and all concerned with real reform in planning to continue to push the Government to support these Bills to become law. To date, the government has insisted that its “Expert Panel on Development Law Reform” is the appropriate forum for debating these issues rather than the Parliament. We beg to differ. This is an opportunity for significant reform that should be taken now. Urban sprawl. The Housing Industry Association is strongly opposed to the use of restrictive urban growth boundaries to contain urban sprawl. The 30 year plan puts in place a non–restrictive city boundary with the expectation that within 30 years 70% of new residential development will occur within the existing urbanized area and only 30% on the urban fringe. But without a restrictive urban growth boundary in place this target is unlikely to be reached given the major difficulties likely to be experienced with implementing one of the plan’s main proposals: the intensification of residential development along many low amenity arterial roads. 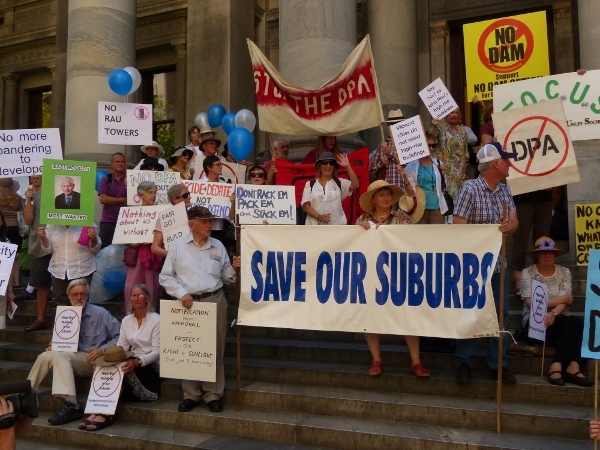 It’s no wonder that COAG has concluded with respect to the 30 Year plan for Adelaide that … ‘the system remains to be tested and contains some ambitious targets for which the viability has not been clearly established.’  The government needs to consider the establishment of a more restrictive urban growth boundary and the re-targeting of densification proposals away from low amenity areas. The quality of new development. Although the development industry has generated a considerable amount of hype about the need to fast track development, which the government has blindly accepted, unfortunately the quality of new development being produced is not being adequately monitored. 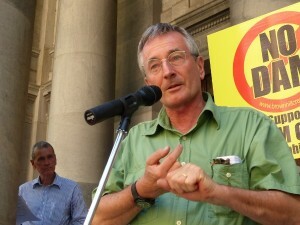 Professor Buxton (RMIT) has expressed major concerns about the overall standard of development occurring in our cities. 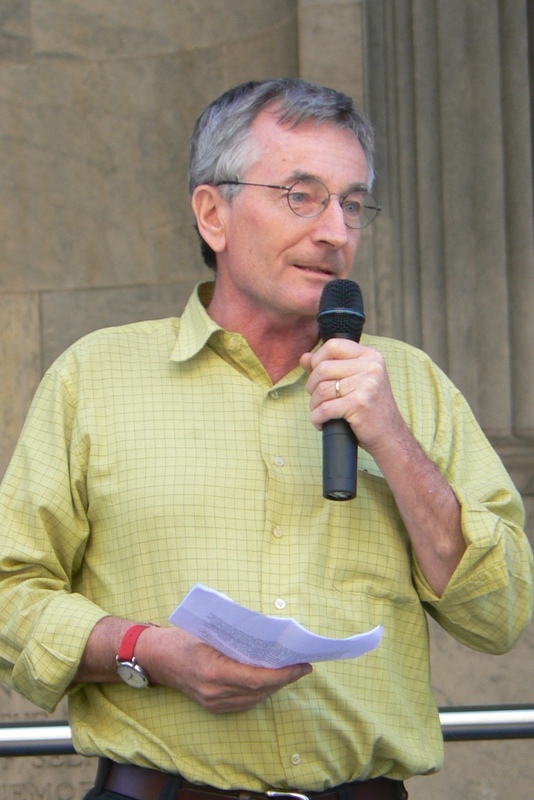 Buxton maintains that: ‘We are designing the world’s worst suburbs, the housing stock is terrible and they have very poor liveability.’  Similarly, Gary Petheridge, president of the Unit Association Owners ACT, has expressed his major concerns about the poor quality of apartment buildings being constructed across Australia, which currently account for 30% of the nation’s housing stock. Urban densification. There’s now overwhelming evidence to show that there are major health hazards in locating people close to high trafficked roads as per the new Metropolitan Inner Growth plan and in the most recent study, the University of Southern California, has found a high correlation between autism and families who live near main roads. The 30 Year Plan for Adelaide touts a policy which recommends that residential development should be kept away from major road intersections but even this objective has been blatantly disregarded in the inner area growth plan. The whole of Adelaide arterial road network needs to be redesignated either as high volume ‘transit corridors’ or low volume ‘activity corridors’ where residential densification is more appropriate. Also, there’s no reason why public transport in some circumstances couldn’t be rerouted to areas where higher amenity values exist for denser residential development. Studies of the popularity of apartments in London for example have shown that those which are located close to attractive parks and open spaces are in high demand. However, until these approaches are properly researched and implemented in a comprehensive transport plan for Adelaide it would be inappropriate to proceed with any specific proposals. Job sprawl. In terms of future jobs and employment the 30 Year Plan for Adelaide follows the Portland, Oregon model where jobs are widely dispersed. Even though billions of dollars have been spent over the past 30 years on upgrading public transport in Portland its use is quite low (12% of total commutes). In stark contrast in Seattle, where jobs are concentrated in major nodes which are well connected with public transport, its use is much higher (21 % of total commutes). This is the model which Adelaide should be following and pursued through an appropriate transport plan. Council planning powers. The development industry is forever looking at ways and means of fast tracking development and stripping councils of their planning powers. Recently, it recommended that inner city councils no longer have responsibility for projects worth more than $5m or buildings taller than two storeys. It has also sought the replacement of councils with private certifiers to make decisions on planning applications currently dealt with under a residential code. 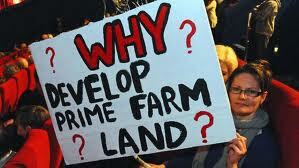 Both proposals are a major concern. The industry’s recommendation for more major development proposals represents a major winding down of our third tier of government and the proposed establishment of private certifiers for a range of planning approvals is fraught with conflict of interest and poor quality decision making issues. In NSW one in six private certifiers has been subject of an adverse disciplinary finding and local councils are demanding that the private certification system be dumped. In addition, as pointed out in a submission by the LGSA of NSW, the use of residential codes in development assessments severely limits the identification of opportunities for urban renewal in the suburbs – surely not even a desirable outcome for the development industry. Other high priority areas for reform are current planning public consultation processes include disconnected land use and transport policies (because we don’t have a transport plan), major project and interim development control legislation and the current makeup of state government planning advisory and decision making authorities. If the government was to adopt this wider planning reform agenda it would be able to regain some level of public respectability by distancing itself from ‘development-at-any-cost’ mantra of the development industry and supporting population growth and planning policies which will be of social and economic benefit to the whole community. 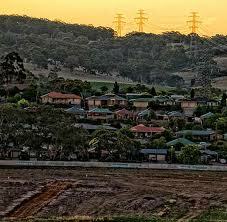 Developers push for bigger cities . The Australian Financial Review. Mar. 2011. Commuting in Portland and Seattle. Sightline Daily. 28th Feb 2012. 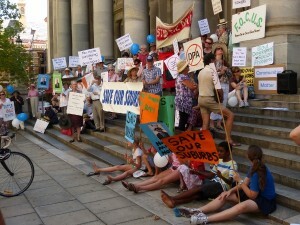 ‘Adelaide’s development lobby plan to strip councils of power’. Sunday Mail 16th March 2013. Submission on the Draft NSW Housing Code. Local Government and Shires Association of NSW. July 2008. 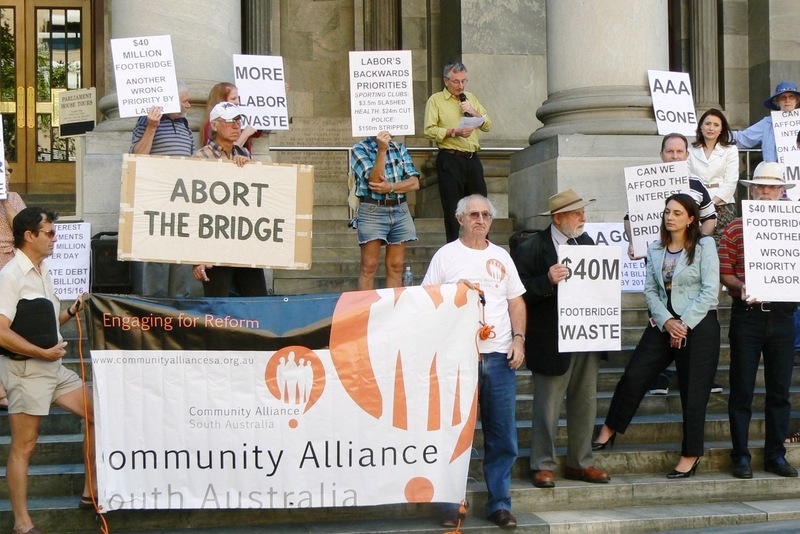 At a rally held on 19th March, Community Alliance SA representatives and members protested the process for the Adelaide Oval Footbridge development. 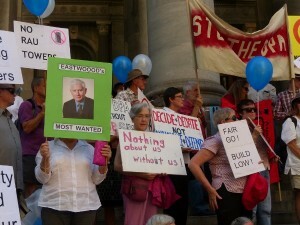 The rally was organised by the Liberal MP Rachel Sanderson, State Member for Adelaide, and held on the steps of Parliament House on North Terrace. 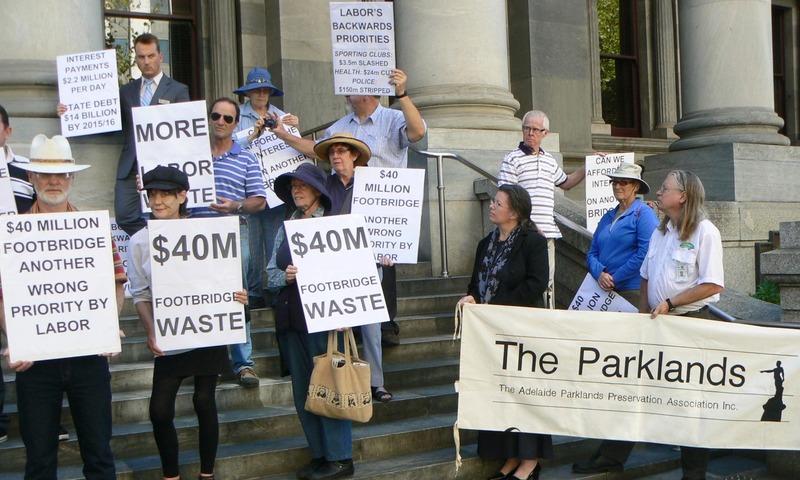 Although the Community Alliance is not aligned to any political party, it opposes the process by which the $40 million dollar ‘bridge’ development over the Torrens is being pushed through. After being rejected by the Upper House, this is being ‘approved’ by the Planning Minister’s use of his ‘interim powers’, excluding the public from any meaningful consultation over this development. Speakers at the rally included Rachel Sanderson, Dr Rob Crocker of the Community Alliance SA, Michelle Lensink MLC, and Kelly Henderson from the Adelaide Park Lands Preservation Association. Dr Crocker spoke about the ‘fake consultation’ that has led to the footbridge development being pushed through against the wishes of the public and without them having any real say. He defined the issue as being all about “Process, process, process……..the community wants a genuine process that includes transparency, accountability and genuine consultation”. Dr Crocker spoke about developments at Woodville at St Clair, Mount Barker, Mayfield in the City and Buckland Park. “The process needs to be reformed to include genuine independence, following clear principles and rules we all understand. At present it appears that decisions are being made behind closed doors by the Minister and his minions, often at the behest of lobbyists and selected developers”, he said. He also drew attention to the more important and larger developments being approved and pushed through without any genuine consultation, and often before consultation was even considered or organised. Dr Crocker said “Even when the consultation system is working ‘properly’ this is a system that does not work well and has cemented in a very poor process, which belongs in the 1920s, not in a society with access to Facebook and Twitter”. Rachel Sanderson and others spoke out against the cost of the footbridge and the Labor Government’s push for this development, including a failed attempt to fast-track the process by giving the footbridge the same classification as low-cost home improvements like solar panels and carports. The footbridge is currently the subject of a Ministerial Development Plan Amendment (DPA) that was even put into interim (or immediate) effect at the same time that the public consultation process began. Worse still, a small change to the wording of the DPA has been made. This results in the DPA now allowing for commercial development, including new office buildings to be built on the site, again without full public consultation. The ‘public consultation process’ for the DPA ends on 20th March, the day after the rally. However, any development applications submitted during the public consultation period will be assessed against this draft DPA, regardless of any changes that are subsequently made. The Alliance wants these Ministerial powers changed to stop them being mis-used in this way. Where the government chooses to engage consultants to assist in achieving its planning objectives, the community is entitled to expect that rigorous and accountable procurement processes will be followed- including ensuring consultant probity and identifying and dealing with conflicts of interest. Where government fails to do this, community confidence is lost. It would be in the public interest for the government to revisit its views and consider releasing the Growth Investigation Areas project report . 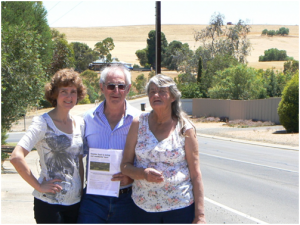 Greens MLC Mark Parnell has commented that the residents of Mt Barker who have been raising this issue for several years must feel both “vindicated and devastated”. On the 18th February, the Burnside Residents’ Group held a rally on the steps of Parliament House, to protest the community’s exclusion from decisions to open up planning for urban infill and high rise developments. 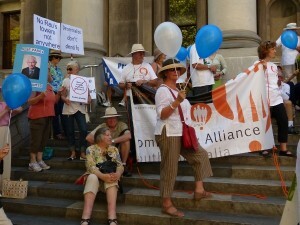 There was a great turnout and the event was attended by many Alliance representatives and member groups. 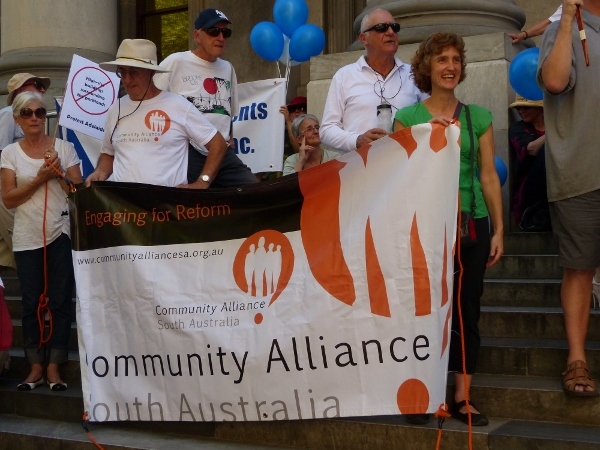 The Community Alliance SA Secretary and Spokesperson Robert Crocker spoke about the current flawed process, the aims of the Community Alliance and the changes we want to the planning and development system. The speakers were: Vickie Chapman, Liberal Shadow Planning Minister & Deputy Leader; Mark Parnell, Greens MLC; Evonne Moore, Vice President of Save Our Suburbs; Anna Sullivan, Burnside Residents Group; Dr Robert Crocker, Spokesperson for Community Alliance SA Inc.; Darian Hiles, Australian Civic Trust; and Kirsten Alexander, Mayor of City of Charles Sturt. Also in attendance were: Steven Marshall, Leader SA Liberal Party; David Pisoni, MP, State Member for Unley; and Rachel Sanderson, MP, State Member for Adelaide.